LA Cowboy: Was the 1970's & 1980s Soviet Union a Hotbed of Cutting Edge Contemporary Architecture? Was the 1970's & 1980s Soviet Union a Hotbed of Cutting Edge Contemporary Architecture? Well, the GUARDIAN Says - Yes! Frédéric Chaubin was wandering through a market in Tbilisi, the capital of Georgia, in 2003 when an old book snared his eye. Although unable to read the words, the French photographer was mesmerised by the images it contained. Chronicling 70 years of post-revolution architecture, the book featured an extraordinary collection of buildings that drew on an extraordinary collection of styles: as well as the Soviet schools of suprematism (a controlled explosion of geometric forms) and constructivism (wild projections, provocative angles), there was a strong western undercurrent, with echoes of everything from Alvar Aalto and Antoni Gaudí to Oscar Niemeyer. And running through all this was a thrilling element of Soviet over-reaching, a hint of sputniks, space rockets and flying saucers. Chaubin was hooked. And so began a seven-year odyssey to seek out and photograph some of the Soviet era's most unusual architectural creations, many now under threat. Each one, says Chaubin, was amazing. "It was like finding an undiscovered monument – a Machu Picchu of your own." 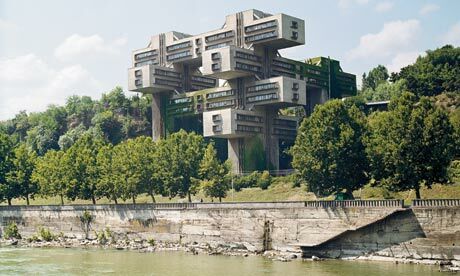 Take the highly improbable Georgian Ministry of Highways, a heroic, Jenga-like arrangement of windowed oblongs completed in the mid-1970s. Based on a concept called the Space City method, and showing an eco-awareness way ahead of its time (especially for a highways agency), the ministry takes up little ground area, allowing nature to swarm in under it. 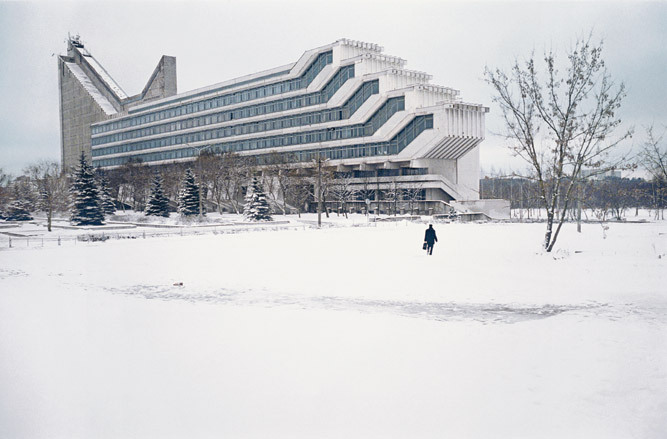 Or take the architecture department of the Polytechnic Institute of Minsk: in Chaubin's photograph – which appears in Cosmic Communist Constructions Photographed, the culmination of his odyssey – it resembles some mighty passenger ferry breaking through a frozen Belarussian river. And then there's the marvellous Druzhba sanatorium by the sea at Yalta, a stack of cogged carousels rising out of a bank of trees, each notch a living space. "It was mistaken for a missile base by Turkish intelligence and the Pentagon," says Chaubin, who is the first to admit that his book is the work of a keen-eyed amateur, not an architecture expert. Perhaps we should be grateful: it's hard to imagine any expert going to the lengths Chaubin did. 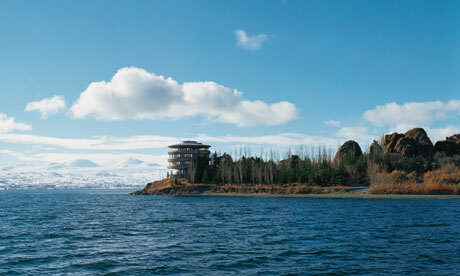 His book features a ravishing shot of the president of Armenia's holiday home, a glazed modern tower perched on a peninsula that looks out like a sentinel over Lake Sevan and the mountains beyond. To get the picture of the home, which perfectly captures its air of invincibility, Chaubin had to hire a boat and bob about as near as he dared, risking the attentions of the president's well-armed security guards. Partly because of the language barrier and partly because the creators of these wonders have rarely been feted, this Soviet capacity for exuberant architecture has passed by all but undetected in the west. It comes as a surprise, a shock even. Their openings were recorded, but usually only in Architecture SSSR, a state magazine, or in books such as the series published in 1987 for the 70th anniversary of the October Revolution, celebrating the architecture of each of the 15 Soviet republics in those years; it was this publication that so transfixed Chaubin in the market. There was also the fact that travelling through the Soviet Union, especially off the beaten track, was not exactly encouraged, so many fascinating buildings remained almost unknown outside their homelands. What really surprised Chaubin, though, was the fact that the most stunning buildings he found had gone up in the dying days of the communist era. 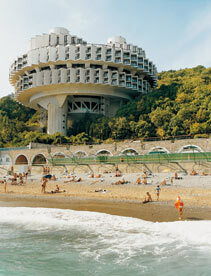 "They were nearly all built in the last 15 years of the Soviet Union. It seemed strange, at first, that they were realised in so many different forms – especially as most Soviet architecture was still in the prefabricated style of the mid-1950s laid down by Khrushchev, with cheap concrete, straight Modernist lines, and little place for the artistic imagination." This, he says, was because the 1970s and 1980s saw an upsurge of local talent, as designers found themselves no longer so shackled by constraints laid down by Moscow. In this way, they could even be read as the swansong of a superpower, created by people freed from centralisation, looking to and borrowing from the west. "You can see in these buildings the break-up of the Soviet Union," says Chaubin, "before the system finally collapsed in 1991." Universities in Russia are beginning to research the buildings of this era, many of which have been abandoned and are falling into disrepair. They generally share one problem: these were public buildings constructed on a huge scale to impress and inspire local populations, with uses that have become redundant now that the state is no longer all-powerful and all-giving. But in among all the science academies and sports training centres, the sanatoriums, swimming pools and camps for youth movement pioneers, there are also some oddities, such as the "wedding palaces". These fascinating things, built in prominent locations, were cathedral-like in their ambitions as well as their size. Chaubin concocted a game around his photograph of the Palace of Weddings in Vilnius, capital of Lithuania. He would show it to people and ask them what it could be: a monastery, a power station, maybe even a giant laboratory? "No one guessed it was a registry office for weddings built on a huge scale to encourage people away from getting married in churches." Chaubin has a serious purpose, too, though: he wants to understand how these buildings came about and who designed them – but the architects have proved hard, if not impossible, to track down. They were civil servants, after all, working for enormous state bureaus. Had they produced such buildings in the west, they might have ended up rich and famous penthouse dwellers; instead, many lived in cramped one-bedroom flats in Soviet-style concrete housing estates. Some of the youngest architects to have worked on these late-Soviet projects are now in their 60s, and have moved onwards and upwards. Oleg Romanov – who in 1985 co-designed a young offenders camp at Bogatyr, Russia, in a zig-zagging style that became known as deconstructivism in the west – is now the vice-president of the St Petersburg Union of Architects. He has been campaigning vigorously against the vast and vulgar Gazprom tower, designed by British architects RMJM, which is threatening to destroy the skyline of what remains one of the most magnificent cities on Earth. One of Romanov's partners on his camp, built by the inmates and photographed by Chaubrin on a bleak winter's day using a 90-second exposure, was Mark Khidekel. In 1994, Khidekel emigrated to New York to work with Philip Johnson, the personification of decadent, bourgeois capitalist design. And George Chakhava, it turns out, wasn't just lead architect on the magnificent Georgian Ministry of Highways, he was also minister of highway construction. So he allowed himself a free hand in the design, inspired by the work of El Lissitzky, one of the leaders of the suprematist movement. The result – a near metropolis in its own right, complete with roads and buildings criss-crossing each another in the sky – lifted the ministry high above a forest, letting nature and avant-garde architecture live happily together. Will these gems survive beyond the pages of Chaubin's book? Ruthless property development may yet see most of them perish, with the now valuable land they stand on becoming a place for unimaginative hotels, casinos, resorts, and villas for the rich. In one piece of good news, Chakhava's Highways Ministry was declared a national monument in 2007, the year the architect died. There have since been plans to convert it into an office for the Bank of Georgia. But not all local people are fans: many see it as a glaring symbol of the bad old days. This has been true of many of the buildings photographed by Chaubin, despite his belief that they represent the end of the USSR rather than its continuation. "I have no nostalgia for the Soviet Union," he says, "but in these strange and wonderful buildings, I saw the skin of a culture that fascinated me.